Once the qualifying process begins, it is difficult to avoid viewing tour successes by Europeans through the prism of the Ryder Cup. This is especially so in a week that brings together the captains of Europe and the United States to mark the countdown to the next contest at Le Golf National near Paris in September 2018. Furthermore, the name of Tyrrell Hatton must now be heavily pencilled in to European skipper Thomas Bjorn's prospective team. The Englishman's irresistible form leaves him destined to be among the side looking to regain the trophy in France, where he would be making his debut. He has landed back-to-back titles with victories in the Alfred Dunhill Links Championship and then the lucrative Italian Open. 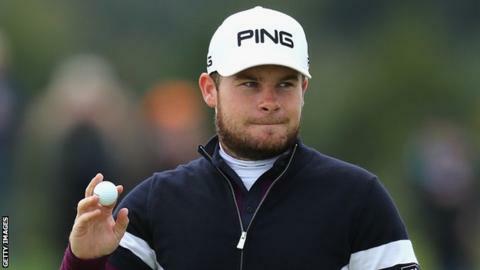 "For any European, the goal is to play a Ryder Cup," Hatton said after a superb final-round 65 in Italy. "I'm certainly no different from that." There have now been seven qualifying events, which is still very early in the phony war period. The 26-year-old from High Wycombe, though, already holds a commanding lead, sitting more than 1.3 million points ahead of Marc Warren, who is fifth in the European Points List. The top four in that category qualify automatically while Hatton is also well clear at the top of the World Points list, from which the next five players for Bjorn's team will be taken. Bjorn will be thrilled Europeans are dominating on their home tour, with all but one of the counting events so far being won by players eligible for the Dane's line up. Frenchman Romain Wattel and Dane Lucas Bjerregaard - whose nationalities fit perfectly with the venue of the next match and Europe's skipper himself - have celebrated early wins. Neither would be among the favourites to last the qualifying course, but at this stage Bjorn will not be complaining. Other victors such as Matthew Fitzpatrick and Paul Dunne, like Hatton, are genuine contenders for the team. It provides Europe's skipper with a strong early narrative as he meets his American counterpart Jim Furyk in Paris this week. The (not quite) 'Year to Go' gathering is little more than a publicity drive, but every little helps when you are trying to create a positive outlook. For instance, in the build up to the 2008 match at Valhalla, there were several awkward news conferences involving Europe's captain Sir Nick Faldo. In isolation these events appear of little consequence and can hardly help or hinder a player trying to sink a putt in the heat of a Ryder Cup. However, they do set a tone. A captain's authority is important and it can affect outcomes. Faldo was never at ease with the role, culminating in his infamous and ham-fisted 'sandwich list' news conference after his apparent pairings were photographed in the week of the match. This had no material effect on where his players hit their ball, but his uncertainty as a leader was exposed. It was ultimately reflected in a disjointed European display and defeat on the course. Former Tournament Committee chairman Bjorn has been Europe's pre-eminent golfing politician over the past decade. He should be too accomplished in the public arena to be caught out and have his leadership undermined as Faldo was. And while the current captain will be pleased with the early form of candidates for his team, the 46-year-old is also aware it is not now that he needs his players to be at their best. Indeed, Bjorn knows from personal experience how qualifying for a Ryder Cup team on the strength of points gained early in the qualifying process can prove a problem. The Dane's form had deserted him by the time he took his place in Paul McGinley's line up at Gleneagles in 2014 and he contributed only half a point to Europe's win from his three matches. This is why he has made the smart move of weighting qualifying points. Those earned after May 24 next year will be multiplied by 1.5 to favour those in the best form as the Ryder Cup approaches. Even so, it would seem Hatton will now take some dislodging from the European line up. Having put behind him a torrid summer when he missed cuts in seven out of eight tournaments, he has - at the very least - created the perfect platform. He can still struggle to contain his frustrations on the course but the past fortnight - he was 45 under par during those two wins - shows he is capable of golfing brilliance. "I'm a passionate person and I just try my best to win a golf tournament," he says of his sometimes questionable on-course demeanour. "You know, occasionally that spills over, and I'm human. I'm going to make mistakes from time to time." Hatton has made very few of those in the past couple of weeks. It is why he will spend the next 10 months or so being asked about the prospect of making his debut in golf's biggest event. That process alone will test his temperament. But he is showing his golf is plenty good enough to come through it. Hatton's last 144 holes have yielded 52 birdies and only seven bogeys - with that kind of firepower and consistency, any captain would surely be more than happy to have him on board. Read more on Rory McIlroy: Is Abu Dhabi his next big championship?